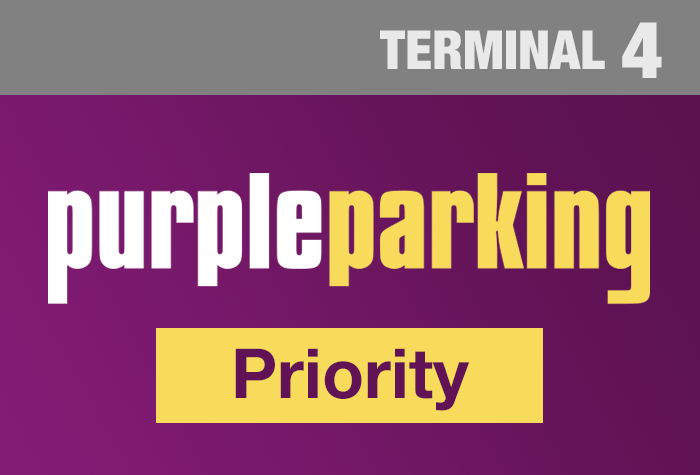 Purple Parking at Heathrow airport Terminal 4 is one of the simplest Park and Ride car parks around. The car park is just 5 minutes from Terminal 4. All you need to do is drive up to the entrance, pull into one of the car parks arrival bays, and while you transfer to the terminal, the car park's team will park your car for you. What's more, it's award-winning security means you can be sure that your car is in safe hands while you're away. Enter the dates above and you can compare Heathrow airport parking with up to 70% off the price you would pay if you just turned up. For an even more convenient package, upgrade to the Purple Parking Park and Ride Plus service to have your car brought back to you when you land. There'll be no need to worry about catching a transfer - your car will be ready and waiting for you outside the terminal so you can get started on your journey home. One of our cheapest car parks at Heathrow, with shuttle bus to the terminal included. 1. Park in one of the arrival bays. 2. Head to reception to check in and hand over your keys. 3. Catch the shuttle bus to the terminal - it's included in the price. It takes 10 minutes to get to Terminal 4. The bus runs every 10-15 minutes from 03:30 until midnight and is included in the price. The car park has bus stop outside reception - wait inside if you want. - The car park isnt suitable for disabled passengers. - If you have a disability we recommend booking the Meet and Greet package. 1. Collect your luggage and call Purple Parking to let them know youre back. 2. Catch the shuttle bus from where it dropped you off to go back to the car park. 3. When you get back to the car park, go to reception to collect your keys. 4. Your car will be waiting in one of the collection bays. This package is just for Terminal 4. The car park has a height limit of 2.4m. There is a bus stop outside reception in the car park. Catch the bus from there. It takes 10 minutes to get to the terminal. The bus runs every 10-15 minutes from 03:30 until midnight and is included in the price. Collect your luggage and catch the bus from where you were dropped off at Stop 21.
purple parking were as reliable as ever. Bus bertween LHR T2 and Bath Road was quick and efficient. What's not to like. I requested park and ride for Terminal 4 heathrow airport but was given a booking which did not have ride facilities directly to T4. Booked as a car park for terminal 4and although we have no quibble with the actual car park and service I would not really recommend it for terminal4. Everything was great, it would have been more better if the buses went directly to terminal 4 rather than being dropped off at terminals 2-3 then getting on a train or shuttle to get to terminal 4. But we did give ourselves enough time. I would say that on the way back once we got to terminal 2, I called the number provided to me by the company to see how long before the bus arrives but instead I found a recorded message. Staff are pleasant and very helpful in person. Our customers rated Purple Parking on average 8/10 (250 reviews). Read Purple Parking reviews.